An explanation of which brush works best for each medium. Synthetic hair brushes provide a smoother stroke than natural bristle, retain their stiffness when used with water based media, and clean easily with soap and water. Synthetics frequently offer greater durability. Although natural bristles usually carry more color, when used with acrylics, natural bristle brushes tend to lose their stiffness. It is a matter of preference: synthetic or natural hair. Mixed media artists have very specific needs related to the limitless techniques and media they employ in the creation of their art. For that reason, our mixed brushes come in the broadest range of shapes and hair types. Our signature line, Select™ Artiste, comes in 29 different shapes, includes 7 different types of hair filament and now features Petite brushes for fine detail painting. 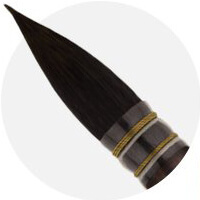 Our premium mixed media brush, Velvetouch™ is comprised of multiple filaments in varying diameters and the blend varies depending on the style of brush to ensure maximum performance. Selecting the right watercolor brush can be both challenging and confusing. Natural hair, synthetics and combinations of the two offer seemingly endless choices. For example, sable hair is often recommended for watercolor painting. However, there are many different grades of sable. Even within the finest grade of sable, Kolinsky, there are variations in hair quality. In synthetics, two brushes can have the same hair color, but that may be where the similarities end. 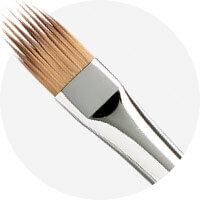 Inexpensive synthetic brushes often use a single diameter filament while better quality brushes are a blend of filament sizes. Multi-diameter filaments hold more color and are designed to simulate natural hair. Synthetics are often more durable and usually less expensive. The best synthetics and synthetic sable blends are indistinguishable in performance from many natural hair brushes. Natural bristle brushes are not all alike. Yes, all hairs come from hogs or boars, but many factors affect the performance of the brush. The stiffest and the most desired bristles come from Chungking and Shanghai in China. The best bristle has long, soft split ends called “flags,” which increase the brush’s color-carrying capacity. Generally speaking, the more flags a brush has, the more color the brush holds. Control is further enhanced when the hairs curve inward and become interlocked. A good interlocked brush will maintain its original shape, help you to control the placement of color, and add textural qualities. 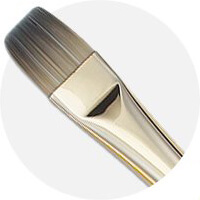 Some artists who use acrylics prefer natural bristle, while some oil painters choose synthetic brushes. Again, it is your choice. Sable is also used for blending and for fine detail in oil color. Unlike bristle, sable does not show brush strokes. 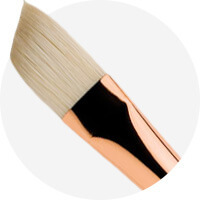 Although natural bristle brushes can be used with acrylics, sable is not recommended.